Potentially, user could examine other hurricanes during that time frame to see if there are similar effects. Educator should go through this entire exercise before introducing it to their students, as a good knowledge of the material and familiarity with the LAS (Live Action Server) will be helpful when questions arise. Although NASA categorizes this lesson as being appropriate for grades 6-12, it would need substantial scaffolding in order to be understood in a middle school class and is most appropriate for high school students. The passage of a hurricane causes a large transfer of heat between the ocean surface and the atmosphere. It also causes surface waters to diverge, bringing cooler water from deeper ocean to the surface (upwelling). These effects are so large that they can be seen by a drop in sea surface temperature (SST) in satellite data observations along the path of the storm. 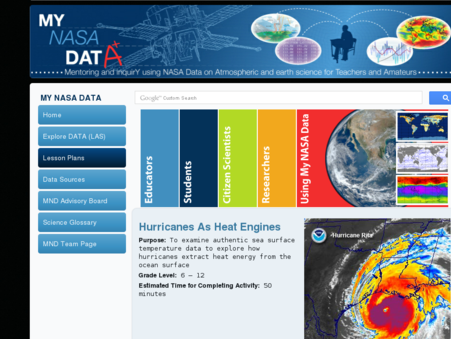 This resource does an effective job at showing students how scientists use observations to better understand the climate system and how hurricanes can affect sea surface temperatures. Comments from expert scientist: Students deal with real data and real scenarios. They gain practice with different kinds of representations of oceanographic data (sea surface temperature). The lesson does not address the second half of its stated purpose: "to explore how hurricanes extract heat energy from the ocean surface". There is no information about "how". Needs information about relevant processes. Students are able to look at real NASA data and create graphs to better understand hurricanes and their influence on SST. Unfortunately, the teaching notes provided are not very helpful. Educators will need to independently figure out how to effectively teach this lesson, particularly because no answer key is provided. Paperless version, or online pdf version, of the lesson is available. Educator may want to use a combination of the two versions to complement teaching style. All links provided are working.